As well as being extremely tasty, berries are very good for your health and make an excellent breakfast or dessert when added to yogurt. All berries help to keep you hydrated, as they have a high water content, and they also aid digestion because they contain a great deal of fiber. Berries such as redcurrants, strawberries, raspberries, strawberries and blackberries are rich in antioxidants, are thought to help prevent and manage arthritis, keep blood pressure under control, help to lower cholesterol and also have a beneficial effect on the heart. 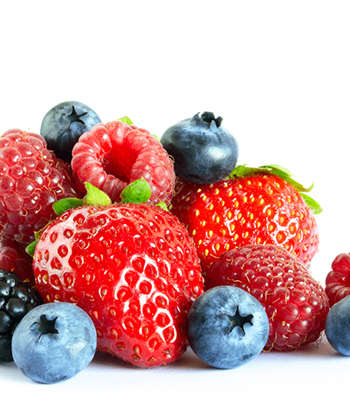 Berries are a good source of vitamin C, which is needed to maintain healthy collagen in the body. This keeps the connective tissues of the body in good condition and maintains cartilage, which aids joint flexibility. Berries contain significant amounts of folic acid, which helps to maintain healthy red blood cells and is also a very important part of a pregnant woman’s diet because it helps to reduce the risk of central nervous system defects such as spina bifida in unborn babies. Raspberries are a particularly good source of vitamins B1, B2 and B3, which help to keep nerves and muscles healthy, aid the release of energy from food, and promote the health of the skin and the digestive system. Fresh berries provide the most health benefits, but dried berries are also very good for you. Drinkingjuices made from fresh berries is also a great way to enjoy the many health benefits they provide.